Explore women-run cooperatives around the world in the Photo Essay. See the effects of commercial fishing on U.S. waters in the photo essay. This photo essay examines aspects of life in nine African countries. Learn about the historic roots of conflict among the breakaway Russian republics in the photo essay. Get to know the faces and places of Saudi Arabia with our Photo Essay. 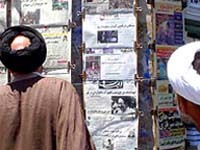 Read about the press and politics in a changing Iran in the Handbook. See the human costs of Colombia's political and economic conflicts in this photo essay.